Russia is planning to commemorate the 70th anniversary of Victory in Asia Day on one of the Southern Kuril Islands. Japan’s ambassador to Moscow is waiting for further information before responding. Russia and Japan are set for another diplomatic row over possible plans by Moscow to celebrate the 70th anniversary of Victory Day on the Southern Kuril Islands. Mikhail Polyansky, an official of the research center of the Russian Defense Ministry’s Military University told RIA Novosti that plans were on to host an event on one of the islands in September. Kyodo reported that Japan’s Ambassador to Russia Chikahito Harada told a press conference that he would gather information about the reported plan so that Japan can respond appropriately. The Southern Kuril Islands are called the Northern Territories in Japan, and comprise of Iturup, Kunashir, Shikotan and the Habomai archipelago. The islands became Soviet/Russian territory at the end of the Second World War when the Red Army liberated the southern half of Sakhalin Island from Japanese occupation that began in 1905. Japan and Russia have not signed a World War 2 peace treaty on account of the former’s claim to the islands. On a few occasions, Russia has offered the islands of Shikotan and the Habomai Archipelago to Japan as a final settlement. These offers were rejected by Japan, fearing a political backlash, among former residents of the islands. Japanese analysts argue that Tokyo’s recognition of the southern half of Sakhalin Island, as a part of Russia was a far greater political compromise. In an attempt to bridge the gap between the countries, in 1991 Japan and Russia set up a visa-free program between residents of Hokkaido, the northernmost Japanese island and the Southern Kuril Islands The largely successful program has enabled many former residents of the Kurils to visit and retrace their roots. This year however, the first trip under the visa-free program has been cancelled. A spokesman of the organizing committee of the program told Tass that the Russian side has not completed the internal training required to host the Japanese visitors. It is unclear whether political tensions over Ukraine and Japan’s decision to impose sanctions on Russia were in any way responsible for the cancellation. 309 Japanese citizens are expected to visit the Southern Kurils this year and 520 inhabitants of the Russian islands set to visit Hokkaido. The trips are arranged between May and October. 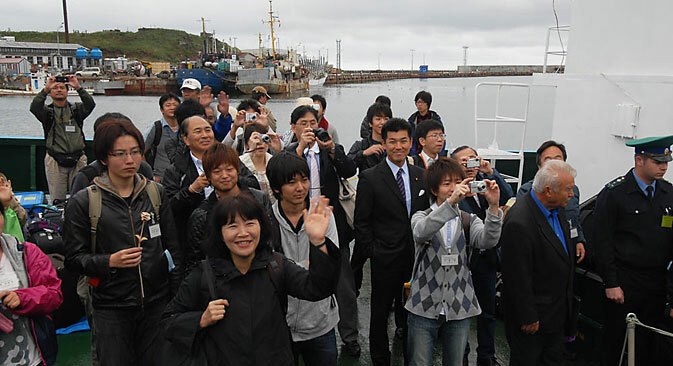 Over 8,000 Japanese citizens have visited the Southern Kurils since the program was implemented and around 18,000 islanders have been to Hokkaido.